Many people buy a second home abroad, only to realise later that the house is unoccupied and unattended for extended periods. In many cases the owner does not know the neighbours and therefore there is nobody to look after the house when the owner is not around. An unoccupied house can attract undesired visitors, in addition leaks or other faults can occur, which remain unnoticed for much too long as nobody checks the house. You want to enjoy your holiday home care free, be certain that when you arrive everything works correctly, your house is clean and that there are no unwanted surprises. With our many years of combined experience in the service sector we identified the need for a property management company that does exactly what it says instead of the broken promises that a lot of people have grown accustomed to, and as a result Andalucia Home Management was born. Andalucia Home Management offers a range of service agreements for the management and renting of your holiday home on the Costa del Sol, allowing for carefree enjoyment of your second home. We are here to help you use your holiday home to its full potential whether it be for your own enjoyment or through our rental service to generate income from your investment. We take care of your holiday home, advertisements, reservations, reception and acompaniment of guests and even take care of the cleaning at the end of the stay. Enjoy the “complete package” like so many home owners already do, but don’t take our word for it, have a browse through our testimonials on the side of the page. Don’t hesitate to contact us to discuss the possibilities for your property, you will not be disappointed. 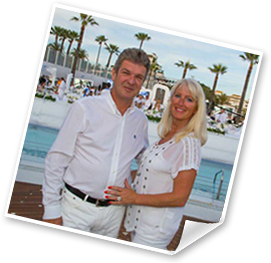 “We contacted Johanna & Bas as we were looking to rent a holiday home for the summer. They were very helpfull with all our questions, and all through the stay.